Help transform a special needs child's life today! 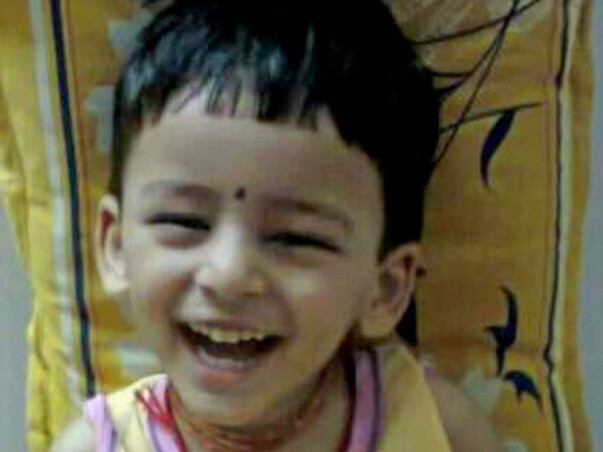 Gopal, currently a smiling, cheerful 4 year old was born after 8 years of marriage and 2 abortions/miscarriages in a Government hospital in Bhopal. Unfortunately, he was also born preterm at 7 months with very low birth weight and delayed cry. He was shifted to a Private hospital and was on ventilator,incubator and medications. After a long struggle he was discharged after one and a half months. His parents had to mortgage their land and the mother's jewelry to pay the hospital bills but the family was very happy to take him home. As he grew older, the family realized that he was not able to do most activities as children of his age. They consulted a few doctors who advised therapy but they could not afford the charges. Gopal at 3 years was first seen in Aadhar and he could not raise his neck, could barely move his arms and had minimal movement in his legs. All he could do was cry and smile. After therapy for one and a half year, Gopal can now say few syllables,he can stand unaided and with help can also walk, can feed himself. The parents are thrilled with his progress! Aadhar Centre is a Child Welfare Organization formed by Doctors, Therapists & Professional Counselors and is devoted to assist and aid the growth of a child into a healthy & socially responsible human being. Aadhar was set up on the 27th of September 2004 and is based in Bhopal, Madhya Pradesh, India. There are mainly 2 divisions of Aadhar- Child Development Division and Psychological Counselling Division. These divisions cater to children with developmental, behavioral, emotional and learning difficulties, from birth to 19 years. We have been providing therapy to special needs children. We currently have 16 special needs below poverty line children, suffering from autism, cerebral palsy who require therapy on a regular basis. Each therapy costs Rs. 5000 and each child requires 12 therapies over 12 months. We want to raise the money for 16 kids to provide them therapy for at least a year. No donation amount is less. Please contribute so that we can provide regular therapies to these children. If you are based out of Bhopal, Madhya Pradesh, India and want to volunteer or feel that you could make a difference in some other way, please feel free to reach out at aadharcentre@gmail.com. Be a part in adding smiles to a lot more children like Gopal. They need your support in the form of money, love and even volunteers! If you believe in us, please share this story with your friends and relatives. Aadhar Gyan Dhatri Samiti was privileged to be associated with Milaap for Crowdfunding for our children with special needs. The response received by you dear donors was amazing and gratifying. The funds that were received were used for therapy of our children particularly physiotherapy, speech therapy and special education. The Annual function of the Organisation was celebrated on 3rd Dec 2018 in a glittering and awe inspiring ceremony. 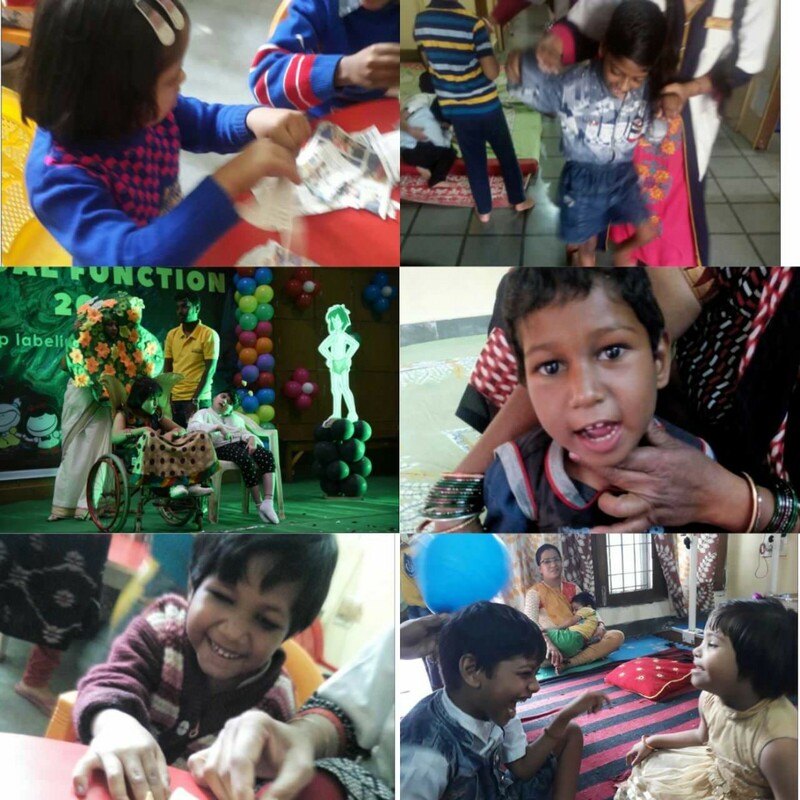 The main highlights of the program were “JUNGLE SAFARI” by all children with special needs wherein they performed the actions of the animals that they were assigned impeccably. The credit would definitely go to the hard work of the educators , unstinting support of the parents and the enthusiasm of the children. The children are also benefiting tremendously with the therapy being given and improving in all domains and all this is thanks to you dear supporter of Aadhar for your unflinching support. We have conducted Disability Identification camps in various slums of Bhopal and we would be reaching out to the identified children with special needs to help them further. Poonam Jatav is a very jovial and amicable 4.5 years old child who came to Aadhar centre about a year ago. After many complications in pregnancy, Poonam was born as the first child to her parents. But much to their disappointment they eventually discovered that there was delay in the motor development (like crawling, walking, sitting etc.) of Poonam. She also had squint in her eyes and was physically differently-abled. They consulted a few doctors who advised therapy but financial crisis was the biggest hurdle (as they belong to a Below Poverty Line Family). Subsequently they came to know about Aadhar centre. 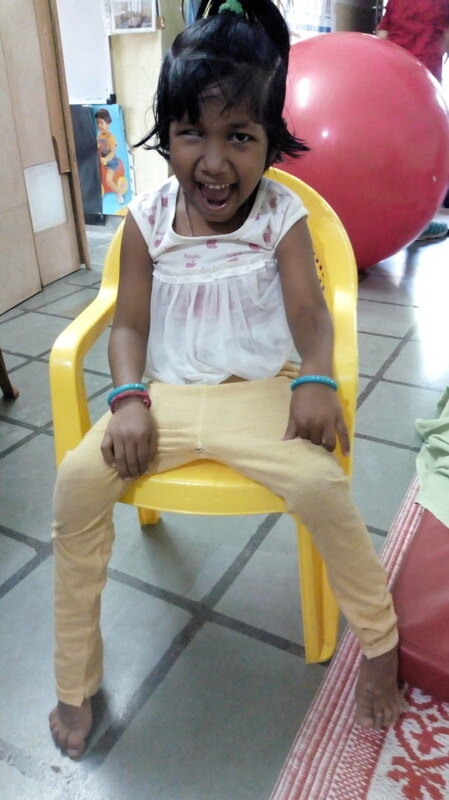 Initially she could not speak much also there was minimal movement in her limbs but with regular training and physiotherapy at Aadhar she can now sit properly with crossed legs, there is also more movement in her limbs and she can recite numbers, months and alphabets. Firstly, they have certain physical and mental barriers in their progress. Secondly, they belong to BPL families, which acts as an impediment for them to receive efficient training and therapies. It is we the youth of this country who can come up together to contribute in the development of these children and provide them the monetary support and love. I urge you all to come forward and support the noble cause. No donation amount is less as it will ultimately bring about a positive change in a child’s life. 2 August-4 August 2018 at NLIU Bhopal. Dr Jagmeet Kaur Chawla Developmental Pediatrician and Child Counsellor and also Director of Aadhar Centre for Child Development and Psychological Counselling took 2 sessions on the 3rd of Aug 2018. The first session was on “Understanding the Psychology of Trauma faced by Children in Need of Care and Protection”. The participants understood the main premise that empathy, sensitivity and compassion are what is mainly needed to understand the children in need of care and protection. The second session that Dr Jagmeet took was on “Communication with Children in need of Care and Protection” Dr Jagmeet started her session with clear understanding of what is communication and where it is needed and also the most important aspects of communication which are mainly non verbal and body language. The understanding of why to donate stems from the understanding needs and building the capacity that entails one to think beyond, connect, and empathize! Keep the funds coming in. Smallest of contribution add significantly!